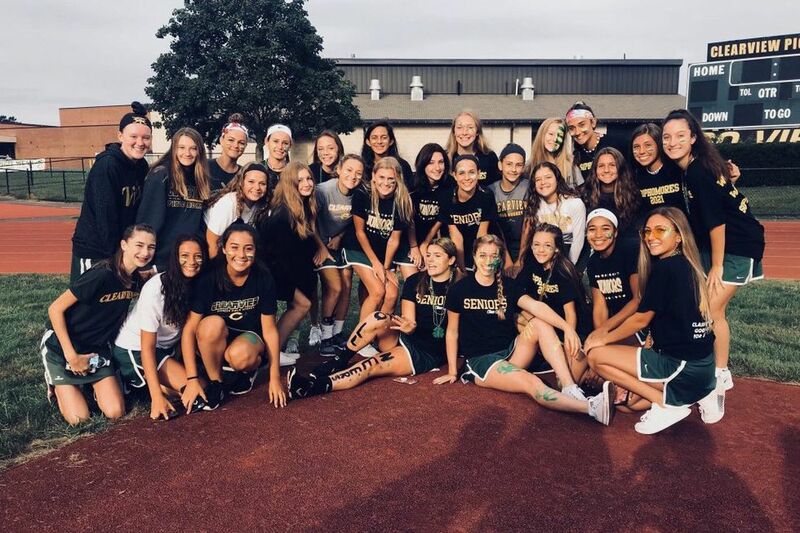 Clearview’s field hockey team, pictured at its opening season pep rally in September, beat Glassboro, 10-1, Monday behind hat tricks from Anna Bruno and Naveah Deichert. Anna Bruno and Naveah Deichert each recorded hat tricks Monday as Clearview's field hockey team rolled past Glassboro, 10-1. Gigi McAlpin, Ali Palumbo, Sage Riso and Abby Vesey also scored. Miranda Mason notched a hat trick in West Deptford's 9-0 victory over Sterling. Allison Flynn and Grace Hoelbinger scored two goals apiece. Mackenzie Rieger scored to lead Pennsville past Deptford, 1-0. Kylie Fitchett recorded one assist. Siani Carpenter and Diana Gaft each knocked in a pair of goals to help Overbrook beat Paulsboro, 7-0. Karina Gaft, Riley Roback and Cristina Roman added goals. Collingswood rolled past Haddon Heights, 6-1. Catie Wilson recorded a hat trick, and Quinn Basewitz, Dash Cruz and Amber Zelem scored. Ryleigh Heck had a hat trick as Eastern defeated Shawnee, 4-1. Kara Heck scored. Haddonfield blanked Audubon, 6-0. Bridget McCormick scored two goals, and Mia Frontino, Abby Marthins, Emily Smart and Caitlyn Tedeschi scored. Sophia Abate's hat trick led Seneca past Paul VI, 5-2. Delayni Elentro and Cassidy Strittmatter added goals. Jack Accorsi and Jack McEvoy each scored a pair of goals to help Clearview beat Arthur P. Schalick, 4-0. Jacob Bodine scored two goals in Cumberland's 3-0 win over Salem. Carlos Cacahuatitan recorded six saves. Jahlyl Barrow recorded a hat trick and one assist as Oakcrest beat St. Joseph, 6-0. Scott Creighton, Gabe Paz and Mason Stokes added a goal each. Knight Dean, Shane McMenamin, Ronaldo Pickering and Sukhdip Singh scored in Burlington Township's 4-1 victory against Cherokee. Glassboro edged Woodbury, 3-2, in overtime. Colin Bridges scored two goals and Santino Mancini scored. Tyler Tomlin's five goals lifted Wildwood past Holy Spirit, 8-4. Alexandro Bautista, Jose Bautista and Jaxon Tomlin scored. Jeff Elliot scored in Palmyra's 2-1 victory over Pitman. Adam Janowicz and Nate Warnock each had assists. Pennsauken defeated Lower Cape May, 3-2. Tyler Bates scored two goals and Ian Pierre-Luis scored. Matt Brook and Fisher Hudak each recorded two goals and one assist as Ocean City beat Pleasantville, 5-0. Luke Varrallo had a goal and an assist. Julian Alvardo-Cruz, Colin Beasley and Preston Beasley scored in Atlantic County Tech's 3-0 win over Atlantic City. Cici Imhotep scored as Moorestown blanked Cinnaminson, 2-0. Jaimi Araujo scored in Seneca's 1-0 win over Cherry Hill West. Hailey Russell's four goals led Riverside past Willingboro, 5-1. Joelle Otto added one goal. April Hartman recorded 16 saves as Pennsville defeated Deptford, 3-1. Hannah Cooksey scored two goals and Arianna Smith scored. Pennsauken Tech beat Paulsboro, 2-1, thanks to goals from Brenda Hernandez and Dalila Velasquez-Mendez. Sarah Schollenberger scored two goals in Woodbury's 3-1 victory over St. Joseph. Kayla Rozanski had one goal and two assists. Erica Cavalier had a hat trick as Burlington City defeated Pennsauken, 4-1. Emma Keefe scored. Breacain McClenehan scored two goals to help Rancocas Valley beat Clearview, 4-3. Cameron Maruca and Ashley Orendac added goals.